Refugees arrive at Kyangwali in Hoima early this month. Hoima District authorities and humanitarian agencies are struggling to contain an outbreak of cholera that has so far claimed 11 refugees fleeing from tribal conflicts in eastern Democratic Republic of Congo (DRC). More than 456 cases have been confirmed, further complicating the team’s efforts to handle the ever increasing daily arrivals into the country. According to Dr Joseph Ruyonga, the Hoima District health officer, the deadly epidemic has also affected 97 Ugandans in Kyangwali refugee settlement, Kyangwali Sub-county, and in a reception centre at Sebagoro Landing Site. Dr Ruyonga said they are currently working with officials from the World Health Organisation, UNICEF, and Medicines sans Frontiers to contain the epidemic. Bunyoro sub-region is currently grappling with big refugee numbers who are fleeing from a tribal conflict between the Bagegere and the Lendu in Ituri province of DRC. The most affected DRC tribes are the Hema, Bagegere, Kebu, Lendu and the Alur. Disease surveillance experts have said areas where the Congolese are fleeing had a cholera outbreak. District officials say thousands are arriving on a daily basis, with 31,256 who have so far arrived since December 19, 2107, according to Ms Kebirungi. 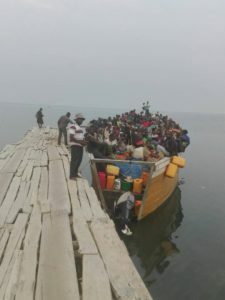 Traveling by canoe boats across Lake Albert, the refugees are arriving at Kaiso, Sebagoro, Nsonga and Senjojo landing sites in Hoima district. On arrival at the landing sites on Lake Albert, the refugees are registered at Kagoma reception centre before being allocated plots in Malembo, Mombasa and Maratatu areas in Kyangwali refugee resettlement settlement.